While talking to a friend online the other day, I was reminiscing about “the good old days” when my children were still actually children. I didn’t want to make the mistake my mother did (“I’m going to make supper, so you get out of the kitchen now!”), so I involved my girls in food preparation activities almost from day one. We have pictures of six-month old Marissa peering over my shoulder from her perch in the backpack, supervising my dinner preparations, and again at 15 months, cutting fresh mushrooms into unidentifiable shapes with a plastic knife for inclusion in that night’s casserole. I had ulterior motives in this, as I really don’t much like to cook. It’s not that I can’t; it’s just that if I’m going to invest that much time doing something creative, I’d like to have something more than a burp to show for it an hour later. My plot worked, and both my girls were quite proficient in the kitchen by the time they were 12 years old, and I was eventually barred from evening meal preparation – for about 10 years! (It was a real jolt when #2 moved out…) Both also cherished their jobs working in a busy restaurant kitchen, and my older daughter is now a full-time cook in an orphanage. They learned to love a task that I haven’t ever enjoyed – and I consider that a major success! So, back to the purpose of this post. My friend has 4-year-old triplet grandchildren, and it struck me that they might enjoy making a favorite recipe or two from my girls’ toddler cooking days. Dare I say that it was actually one of the few things I made when I was a kid – and I was a lot older than a toddler? I promised to share the instructions with her, then realized that there were surely other people of all ages who would enjoy it as well, so decided to share it here. Don’t let the simplicity of this keep you from the fun of it – even if you are well past age 5. A picture is worth a thousand words here. As always, click the photo to enlarge. Bedding/grass – Shredded lettuce in this photo, but could be shredded cabbage, carrots, or cheese, or a leaf of any sort of edible greens. Coconut would even do in a pinch. Body – Pear half. We’ve always used canned pears, but there is no reason not to use fresh if you prefer. If using a fresh pear half, I recommend inserting a knife to make a slit for the ears instead of just trying to stick them in. Eyes – Nothing beats whole cloves for eyes. Be sure children know not to eat them! Tail – A bit of cottage cheese makes a wonderful, nutritious, fluffy looking tail. We have occasionally used a marshmallow which is still wonderful, just not so nutritious. Ears – Nothing beats sliced almonds for ears! Nose – I like using a raisin best. Roll it between your fingers to make it rounder if you wish. We’ve also used a bit of a pink miniature marshmallow, piece of maraschino cherry, or a red hot. Note – bunnies can very easily become mice if you use a piece of shoestring licorice for a tail. Candle holder – One slice of pineapple. Might be able to substitute another fruit with help from an adult to cut it, but we like the simplicity and convenience of canned pineapple rings. Besides, they fit the average banana perfectly. Candlestick – Banana, or really just part of a banana. If you are shopping expressly for this recipe, do yourself a favor and buy bananas with long, straight parts. Curved candles look sort of dopey, and they are tough to light. Flame – Half of a maraschino cherry. I raided a can of fruit cocktail tonight, because I didn’t have a jar of cherries open. 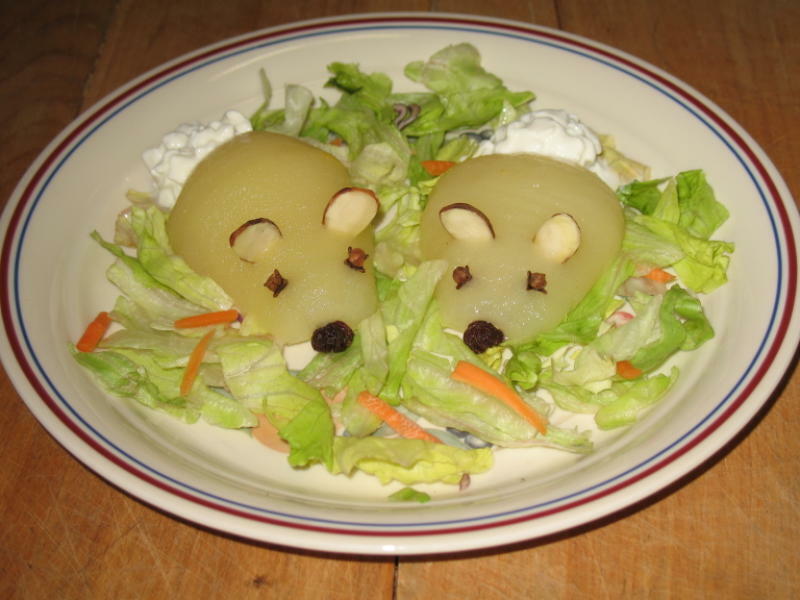 Decorations – When I was a kid, pineapple rings were yellow, but this one was a really bland color and I thought the salad looked boring. Since I opened the fruit cocktail in search of a cherry anyway, I picked out some peach chunks and used them as decorations. I think it looks much prettier this way! Use your imagination on this part, and I’m sure you can come up with all sorts of ideas.